PENALTY! And on the stroke of half time, Chelsea have another penalty! This time Ben Haim I gives away a spot-kick after making a sliding tackle on Costa as he bombed forward. Oscar takes the penalty... and scores with a low drive into the bottom left corner of the net! HT: Chelsea 2-0 Maccabi. And we are back underway here at Stamford Bridge with the Blues leading 2-0. 48mins: Loftus-Cheek makes a good run forwards before passing to Costa, who forces Rajkovic into a save at his near post. 52mins: The pace of the game has slowed down considerably but Chelsea are still forcing Maccabi to defend with numbers. 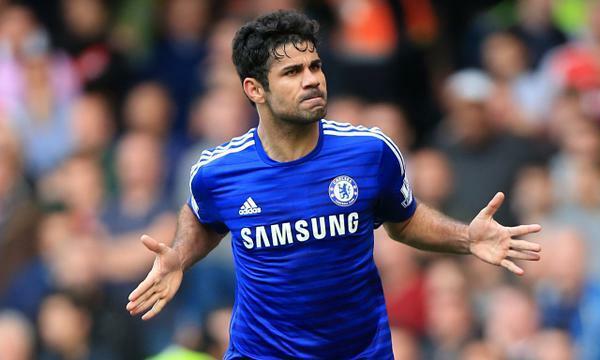 Costa, in particular, is proving a handful for the visitors. 54mins: Shpungin has just fallen over twice - poor guy. But as he gets back up Rikan volleys the ball towards goal - only to see Begovic deal with the shot comfortably. 58mins: GOAL! And Costa has just scored a brilliant curling volley after Fabregas provided a delicious pass to the Brazilian! Chelsea 3-0 Maccabi. 60 mins: Chelsea now get a free kick after Loftus-Cheek is fouled just outside the box but Fabregas fires his shot straight at the Maccabi wall. The Chelsea fans have all got on their feet as they sing "Oh Special One stand up!" Mourinho gives a little wave to the supporters but remains composed. He knows how big this result is for his side. 69mins: Another change for the visitors as Shpungin comes off for Peretz. 72mins: Fabregas takes a free kick near the byline which Rahman gets his head too. It doesn't come to anything as Maccabi clear their lines but it seems Costa was hauled down in the area at the same time, although no penalty has been given. 76mins: Loftus-Cheek comes off to applause after a good showing. He's replaced by Traore. 77mins: GOAL! And Chelsea have scored again! Hazard made a fine run down the middle of the pitch on the counter before squaring the ball to Remy on the right. The striker forced Rajkovic into a save but the ball then fell to Fabregas and the Spaniard tapped in from close range to make it 4-0. He looked relieved after netting that. 87mins: What a miss from Igiebor! The midfielder latches onto a cross from the right but somehow fires high despite only having Begovic to beat from close range. Full-time! And that's it: Chelsea have beaten Maccabi 4-0 to open their Champions League campaign with a positive win - plus they didn't concede tonight. This result will undoubtedly give the side confidence ahead of the club hosting Arsenal here on Saturday. We'll have player ratings and all the reaction from the post-match press conferences soon! So that's us done here at Stamford Bridge. We have Mourinho's reaction to finally winning again and player ratings on the site. Thanks for following our live blog! We hope you enjoyed it!